Alberto Hurtado, SJ, served the poor in Chile and founded the Hogar de Cristo for young people. Born in Chile (of Basque origin) on January 22, 1901, Hurtado was only four when his father died. He grew up with financial difficulties, but a scholarship enabled him to attend a Jesuit school in Santiago. Later he studied law at the Pontifical Catholic University of Chile. Hurtado entered the novitiate of the Society of Jesus in 1923. After philosophy and theology studies in Spain and Belgium (because the Jesuits were expelled from Spain), he was ordained to the priesthood in 1933. Hurtado was interested in labor law before entering the Society and long desired to improve the lot of the poor. Upon his return to Chile in 1936, he became a teacher at his alma mater, the Pontifical Catholic University, but also reached out to the poor, especially to the young. Alberto Hurtado founded his own organization for poor and abandoned young people, Hogar de Cristo. The Hogar de Cristo shelters quickly spread throughout Chile and served thousands of needy youngsters. Hurtado established the Trade Union Association of Chile and published three volumes on the labor movement. He also founded a periodical, Mensaje. Rushed to the hospital with intense pain one day in 1952, Hurtado was diagnosed with pancreatic cancer and died soon afterwards. His death was national news. 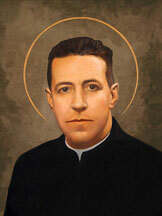 Hurtado was beatified in 1994 and canonized by Pope Benedict XVI on October 23, 2005. He remains very popular in Chile to this day. His Facebook fan page has more than 50,000 followers. Video introduction to the life of St. Alberto Hurtado, produced by the Apostleship of Prayer.